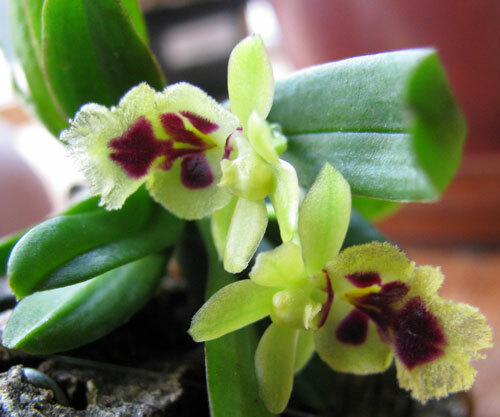 Haraella retrocalla is a miniature orchid with attractive yellow-and-red flowers that have a nice citrusy fragrance. If well cared for these plants can bloom almost continuously. Each flower spike blooms sequentially, with up to three flowers at a time, and continues for several months; a mature plant will usually have two to four flower stems active at any given time, with open flowers on some of them. They are quite easy to care for. The plants grow monopodially, and their stems seem to like growing horizontally so that the leaves overlap less and receive more light. Branching of the stems is infrequent in my experience, but it does happen sometimes. They can be grown in pots, but generally do better mounted, which also accomodates the plant's growth habit a bit better. (To me, they also look better mounted!) If you grow yours mounted, put a bit of sphagnum moss around the roots to keep it more moist. In pots, fine bark potting mixes tend to work well. They don't like to dry out too thoroughly; in pots, this usually means watering every 2-3 days. If growing them mounted, you'll most often have to water daily. Many people water by misting them thoroughly or by spraying them with a hose, but I tend to dunk it in a bucket. Good humidity (about 70%) will make them not dry out as quickly, but use pots if you can't provide humidity over 50%. Fertilize regularly, such as weekly. If the plant is grown mounted, fertilizer may be retained better if the mount is set horizontally. They accept a fairly wide range of temperatures, but for best results give them intermediate temperatures, 70-80°F during the day (21-26C), cooling off by 10-15 degrees (6-8C) at night. This is a fun orchid, and quite easy to grow. I really enjoy them!